WITH a monthly pay of $1,700, Mr Steven Chua is possibly one of the highest-paid cleaners in Singapore. But the pay of the 52-year-old has not always been that high. Six years ago when he joined his current employer Weishen Industrial Services as a general cleaner, his monthly pay was $850. In 2008, his pay rose to $1,000, after he was trained to use cleaning machines like the high-pressure water jet. It grew steadily to $1,700 after he mastered a $200,000 cleaning machine that allowed just one worker to clean a space of 15 basketball courts in an hour, instead of four to five workers. His boss Jimmy Lim considers him to be a 'premium cleaner' among the crop of 2,000 cleaners in the company. But other cleaners do not have it so good. Cleaners in general have seen sharp falls in their monthly wages. In 2000, the median gross wage for cleaners and labourers was $1,277. Last year, it fell to $1,020. For those who clean offices and building premises, their mean monthly gross pay was $815 last year, sitting near the bottom of the Ministry of Manpower's annual wages report released yesterday. The only workers who earn less are car washers, who make $750 monthly. Cleaning company bosses offer various explanations for the wage stagnation. The top gripe is buyers of cleaning services, who go for the cheapest bid and suppress wages of cleaners in the process. 'The line is labour intensive. Almost all that we collect from contracts goes to cleaners. If buyers are not willing to pay well, cleaners' pay will be directly affected,' says Ms Sharon Kee, project director of Horsburgh Engineering that hires about 100 cleaners. Another problem is the lack of industry regulation. The low barriers to entry lead to poor standards, says Mr Milton Ng, president of the Environmental Management Association of Singapore (Emas). 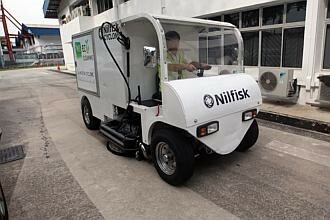 There are more than 900 cleaning companies in Singapore, yet only 61 of them volunteered to be accredited by the National Environment Agency (NEA). The Government is now considering a Bill to license cleaning firms and set minimum standards that companies must meet before they can operate. The Bill is likely to take effect over the next two years and will complement NEA's voluntary accreditation scheme. The labour movement is making a stronger push for best sourcing - to get service buyers to look at factors other than cost. Some buyers have started to come on board. Mr Lim Chin Boon, managing director of home-grown Clean Solutions that hires more than 1,000 cleaners, credits town councils for improving the pay of cleaners. Full-time cleaners who sweep and wash HDB blocks now get about $1,000 each month, higher than those who clean public places, because town councils require their cleaning contractors to send workers for training. Cleaning companies thus cannot rely on low-skilled and poorly paid workers to win cleaning jobs from town councils. While some lessons from the security sector's experience in raising guards' wages can apply to the cleaning sector, industry players say that at the end of the day, the two sectors are still different. For one thing, Weishen's Mr Lim believes that because Singaporeans shun cleaning jobs, the presence of foreigners in the sector cannot be avoided. If the Government were to further restrict the inflow of foreign workers in the cleaning sector, as it does for security guards, the cleaning industry will have 'severe manpower shortages', he says. 'But sending cleaners for compulsory training and accrediting cleaning companies (like the security sector) will definitely raise standards,' said Emas' Mr Ng.